If you eschew such paraphernalia as picks and want to go au naturel with your right hand, you should try finger-style playing, or fingerpicking. Fingerpicking means that you play the guitar by plucking the strings with the individual right-hand fingers. The thumb plays the bass, or low, strings, and the fingers play the treble, or high, strings. To play finger-style, hold a guitar in your lap and drape your right arm over the upper bout, keep your right hand perpendicular to the strings. 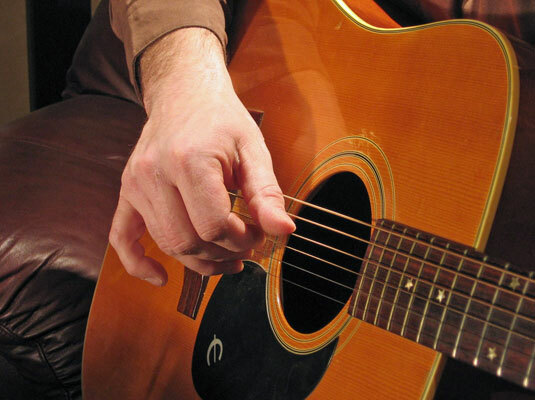 When fingerpicking, use the tips of the fingers to play the strings, positioning the hand over the sound hole (if you’re playing acoustic) and keeping the wrist stationary but not rigid. Maintaining a slight arch in the wrist so that the fingers come down more vertically on the strings also helps. Although you can fingerpick with your fingers, you can also use special individual, wraparound picks that attach to your fingers — called, confusingly enough, fingerpicks. For classical guitar, there are two special right-hand strokes that you’ll use (the free stroke and the rest stroke). To produce these strokes, you must hold your fingers almost perfectly perpendicular to the strings to execute the correct technique. A perpendicular approach enables your fingers to draw against the strings with maximum strength.